How will Finablr’s IPO change the cross-border sector? This week we’re analysing the next big potential IPO in the cross-border sector – the Finablr group. But first, it’s always good for the sector when The Economist covers it. It’s even better when they work with us to analyse and interpret the data behind the pieces. The first article is here (including our data) with more to follow in the print edition tomorrow. …the holding company of UAE Exchange, Travelex, Unimoni and others. The company released the first documents this week ahead of its potential London IPO. 25% of the company will be sold initially (mostly by insiders), along with an additional $200m in new shares. There are very few public, dedicated cross-border payment companies (see our Top 100 list) and no large company has been listed in the sector for many years. So this is big news and will impact everyone in the space. What do we make then of a company doing $114.5bn of annual FX flow (more than Western Union or PayPal), whose financials were until recently a closely guarded secret? While the numbers remain indicative (they have not published their final prospectus), we can see that travel money is the largest segment of the business but is also the slowest growing and carries the slimmest profit margin. 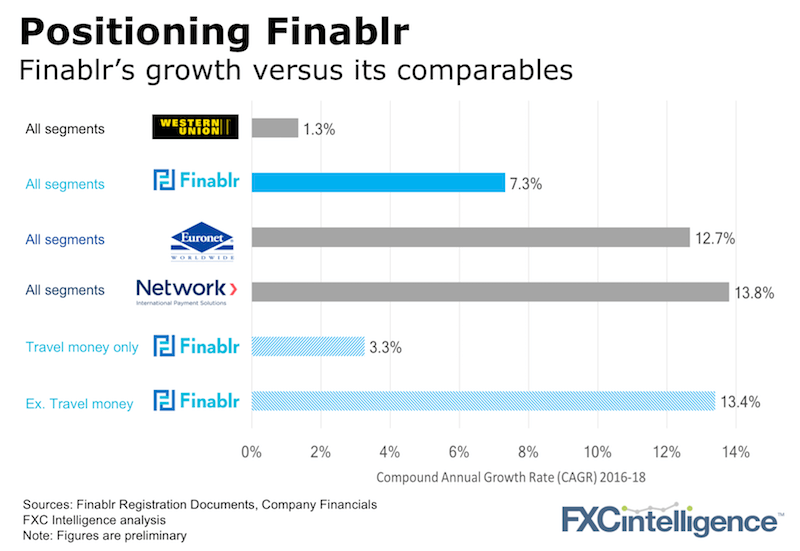 Comparing Finablr to the rest of the sector then depends how you view it. As there is not one true comparable, we need to look at a few. Growth is the one key driver of value in this space (as we’ve said here). 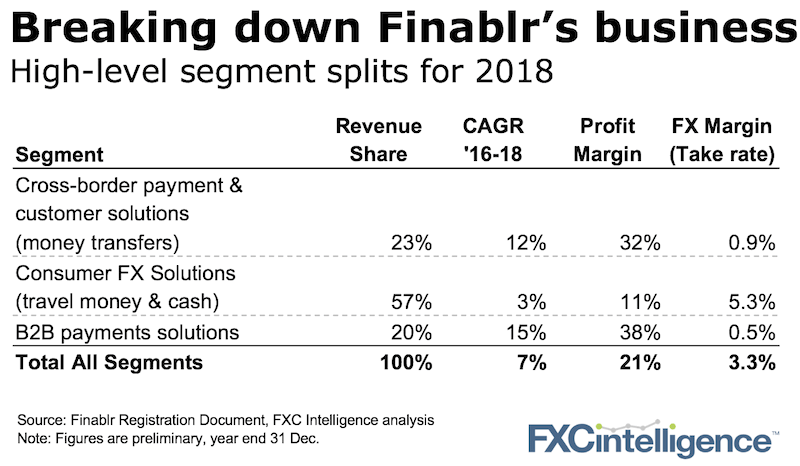 The initial numbers presented show 43% of Finablr’s business is growing strongly and has decent profit margins, while 57% (travel money) isn’t. That makes two if not three business lines to value. The company claims to have a unique end-to-end offering across the whole value chain, which gives it an advantage in the B2B segment. Visa, Mastercard, and Western Union are all opening up parts of their networks too however, so while this is not a new concept it may be very valuable. Who are the right comps for Finablr? There’s some of Network International (a Mid-East payment company who IPOed strongly this week), some Euronet (also performing strongly) and a bit of Western Union (hanging in there). Finablr of course will be looking to position as close to Network International and perhaps Euronet as possible. The figures are too preliminary right now but over the period ahead, we’ll be digging into Finablr to assess its business model and establish its valuation. If Finablr does come to market strongly, it can only be good for everyone else too. Unless you’re an M&A buyer in which case the price will have just gone up.